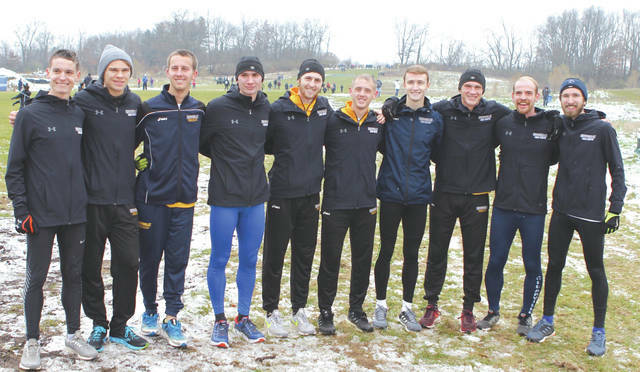 Members of the Cedarville University men’s cross country team celebrate after placing fifth overall, Nov. 17, at the NCAA Division II Midwest Regional meet, in Hillsdale, Mich. The Yellow Jackets earned an at-large berth to the NCAA D-II national championship meet, which will be held Dec. 1 in Pittsburgh. CEDARVILLE — The Cedarville University men’s cross country team Yellow Jackets have been extended an at-large bid to the 2018 NCAA Division II Men’s Cross Country Championship. The meet will be held on Dec. 1 at the Bob O’Connor Golf Course at Schenley Park in Pittsburgh as part of the NCAA Division II Championships Festival. Head Coach Paul Orchard’s squad has been ranked as high as 17th in the U.S. Track and Field, Cross Country Coaches Association (USTFCCCA) Division II national poll this fall. The Midwest Region is considered one of the toughest in the country and the Yellow Jackets placed fifth in the regional, Nov. 17 in Hillsdale, Mich. The top three teams from the eight regions earn automatic bids to the national meet with an additional 10 at-large teams filling the field. Ethan Sullivan covered the 10,000-meter distance in 32 minutes, 29.1 seconds to place 23rd out of 217 competitors, earning All-Midwest Region honors. Trenton Classen was 28th in 32:42.2. Three other Jackets were in the Top 50. Caleb Pendleton was 36th (32:59.5), Andrew Sholl finished 47th (33:12.7), and Alec Weinhold crossed the line 50th (33:18.0). Ethan Gatchell came in 64th (33:31.9) and Russell Schultz was 134th (34:44.0). Coach Orchard has not named the seven Yellow Jackets men’s runners who will make up the team in Pittsburgh. Central State University runner Raymond Korir will also be competing at the NCAA national championship. Korir finished second overall in the South Regional race, which was held in Lakeland, Fla. He’s the first Marauders runner to earn an automatic cross country bid to the national championships. This is the third time the Yellow Jackets have qualified as a team. The 2012 and 2013 squads also advanced finishing 15th in the country each time. Cedarville ran on the national championship course earlier this fall. The Jackets placed fourth out of 29 competing schools in the Rock Pre-Nationals on Oct. 20. WOMEN’S TEAM EIGHTH: Cedarville closed out the women’s cross country season by placing eighth in the NCAA Division II Midwest Regional, also at Hillsdale, Mich.
CU’s next three runners were within seven seconds of one another. The trio included rookie Bethany Sholl (54th; 23:23.4), Rachel Sweeney (57th; 23:29.4), and another freshman Remington Hobson (59th; 23:30.7). Amy Plank was 84th in 24:02.4 and Sarah Hoffman placed 89th in 24:06.6. There were 192 total competitors. https://www.fairborndailyherald.com/wp-content/uploads/sites/50/2018/11/web1_CUCCteam_PS.jpgMembers of the Cedarville University men’s cross country team celebrate after placing fifth overall, Nov. 17, at the NCAA Division II Midwest Regional meet, in Hillsdale, Mich. The Yellow Jackets earned an at-large berth to the NCAA D-II national championship meet, which will be held Dec. 1 in Pittsburgh. Photo by Tami Classen. For more information on the Cedarville University athletic program, please visit their website at yellowjackets.cedarville.edu .